Purpose: The purpose of this study is to evaluate the effectiveness of three-dimensional (3D) miniplates over standard miniplates in the management of mandibular angle fracture. Materials and Methods: This study included 40 individuals who were diagnosed clinically and radiographically to have sustained mandibular angle fracture and subsequently underwent open reduction and internal fixation (ORIF). All participants were divided randomly in to two groups. Group I included 20 patients who underwent ORIF for angle fracture with superior border plating using 2 mm 4 hole with gap miniplate while Group II included 20 patients who underwent ORIF with rectangular 3D miniplate placed through an intraoral incision in conjunction with the use of a trocar through percutaneous route for fixation of plate. Results: Patients who were treated using 3D plates had more pain on visual analog scale score and reduced mouth opening in the immediate postoperative phase. However, the stability at the facture site was superior to that of those treated by superior border plating. Conclusion: 3D plate was found to be standard in profile, strong yet malleable, facilitating reduction, and stabilization at both the superior and inferior borders, thereby giving a 3D stability at the fracture site and early return to normal function. A fracture of angle region of mandible has remained a challenge in its management because of its unique anatomy, muscular attachment, and thickness of cortical plate which is interposed between the thicker tooth-bearing mandibular body and the thinner ascending ramus. In general, fracture pattern is dictated by the direction and severity of external force. In the mandibular angle region, in addition to these factors, the attachments of highly active muscles on the medial and lateral aspects have ramification not only on the fracture pattern but also on its management. Considering this fact, the fracture only can rarely be adequately reduced by simple intermaxillary fixation (IMF). Therefore, the primary technique is open reduction. Various type of osteosynthesis in the form of lag screws, compression plates, etc., were tried with varied success. We hypothesize that Champy's method of osteosynthesis is not adequate to counter the muscle forces at the mandibular angle region and three-dimensional (3D) stability at the fracture site can be better achieved by the use of a 3D plate. The choice of fixation in maxillofacial skeleton should be tailor-made based on the fracture patterns, displacement, stability of segments, and satisfactory postoperative function. However, individual fracture constellations may benefit from variation in plates and their localization. Hence, the present study is aimed at a comparative evaluation of effectiveness of superior border plating versus 3D plates in the management of mandibular angle fractures. This study included 40 participants who were diagnosed clinically and radiographically to have sustained mandibular angle fracture and underwent open reduction and internal fixation (ORIF) in our unit during the period of August 2014–January 2017. Ethical committee clearance was obtained from the Institutional Ethics Committee. Informed and written consent were obtained from the patients using standard surgical protocols patients were treated. Group II - Included 20 patients who underwent ORIF with rectangular 3D miniplate (2.0 mm) placed through an intraoral incision in conjunction with the use of a trocar through percutaneous route for fixation of screws. Surgical treatment provided within 7 days of injury. Forty patients were chosen based on the above-mentioned criteria. Patients were diagnosed on the basis of case history, clinical examination (laceration, infection, paresthesia, occlusion, mouth opening) and radiographic interpretation. Surgical profile, including hematological investigations, viral screening, serum creatinine, blood urea levels, random blood sugar level, electrocardiogram, and Chest X-ray, was done preoperatively. Inter-incisal opening: Measured in millimeters with the help of scale. Need for any other additional fixation method. The patient was followed up periodically on weekly interval for a month and then at 3 months and 6 months. The study consisted of a sample size of 40 patients who were diagnosed clinically and radiologically to have sustained angle fracture of the mandible. A total of 20 of these patients were treated by stainless steel miniplate (Group I) while 20 patients were treated by 3D stainless steel miniplate (Group II). The age group of all patients ranged from 17 years to 50 years of age, with mean age of the patients being 25.6 years in Group I and 28.10 years in Group II, respectively. Out of the 40 patients, 36 were male, and 4 were female who were distributed into two groups randomly. The etiological factor for the mandibular angle fracture was road traffic accident in 20 patients, interpersonal violence in 14 patients and fall in six patients. The duration of the surgery was compared between both the groups. The mean duration of procedure in Group I is 76.10 min and Group II is 105.60 min which was statistically significant (P = 0.001). Mann–Whitney U-test was applied to compare the results between the two groups. 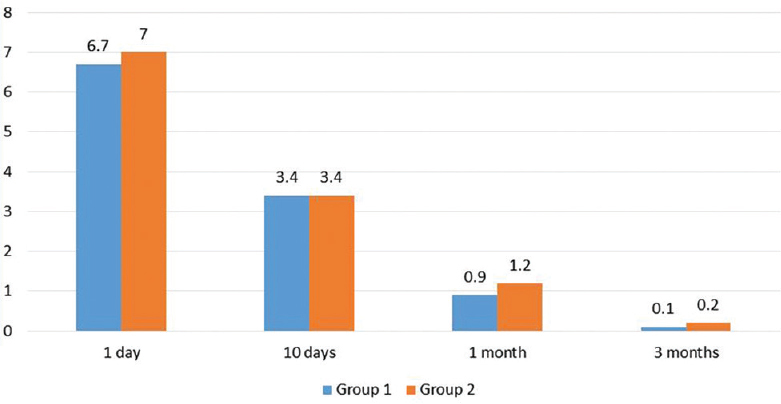 Statistical analysis did not show any significant difference of mouth opening during 1st postoperative day; however, it was significantly higher on postoperative follow-up during 10 days, 1 month and 3 months, respectively. Mann–Whitney U-test was applied to compare the VAS score between two groups. 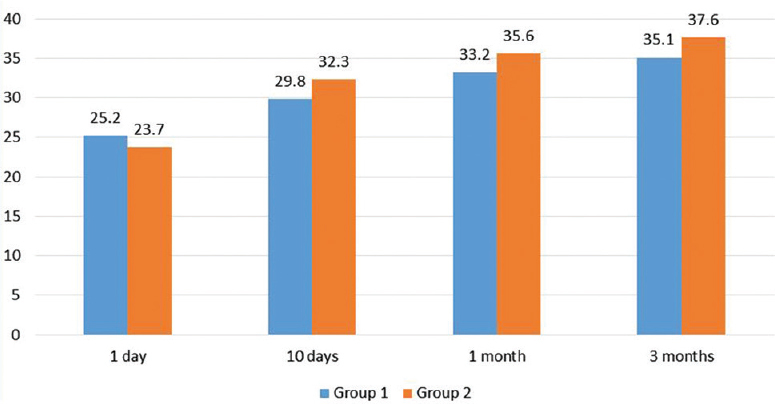 There was no significant difference in the mean VAS score among the Group I and Group II when compared immediate postoperatively to 3 months follow-up. However, with regard to paresthesia of the inferior alveolar nerve, two patients in Group I reported paresthesia postoperatively. With regard to hardware failure, 8 patients (20%) in Group I reported with hardware failure. There was no significant difference between the two groups with respect to hardware failure (P = 0.474). With regard to the need for postoperative IMF, due to deranged occlusion and mobility of the fractured segments, 12 patients (30%) in Group I underwent postoperative IMF. Controversy still prevails regarding the optimal treatment of the mandibular angle fractures specifically pertaining to the number of fixation devices to be used and anatomic positioning of fixation devices in addition to the surgical approach to be used. Biomechanical analysis of the mandible has demonstrated that when an occlusal load was placed on ipsilateral molars, splaying was produced along the inferior border of the angle of the mandible in a model in the single miniplate technique and emphasized that paired miniplate fixation (one plate on the superior border and one plate on the inferior border) may provide superior fixation of angle fractures over the single superior border technique. The mandibular angle fractures are under a great degree of torsional strain than any other areas of mandible. Hence, as per our hypothesis, 3D plates provide higher stability in this region., This present study was designed with an aim of evaluating the efficacy of superior border plating with fixation visa a vise 3D miniplate fixation in the management of mandibular angle fracture. 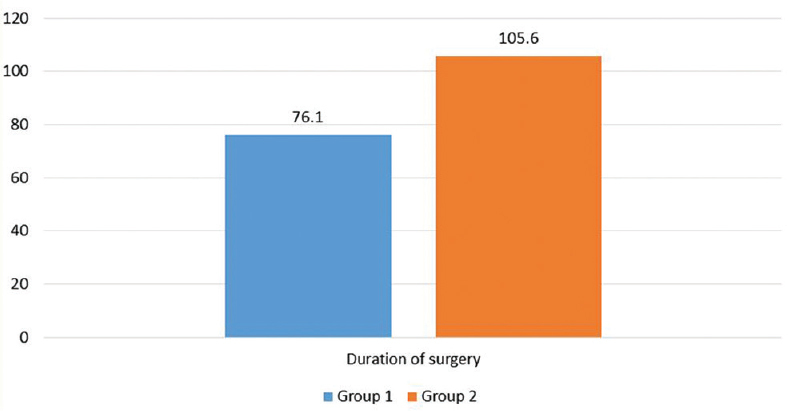 Duration of surgery in both groups was measured intraoperatively from time of first incision to final closure (in minutes) in both the groups. It was 76.10 min in Group I and 105.60 min in Group II as shown in [Figure 1]. The data were statistically significant (P < 0.001). Since the patients in Group II required the use of a trocar through percutaneous route for fixation of screws at the lower arm of the 3D plate in addition to the intraoral approach for fixation of screws at the upper arm, the duration of surgery was a little longer when compared to patients in Group I who required only an intraoral approach for the adaptation and fixation of the minipalte. With regard to the mouth opening, the mean mouth opening in the immediate postoperative phase in both the groups was found to be statistically not significant (P = 0.217). 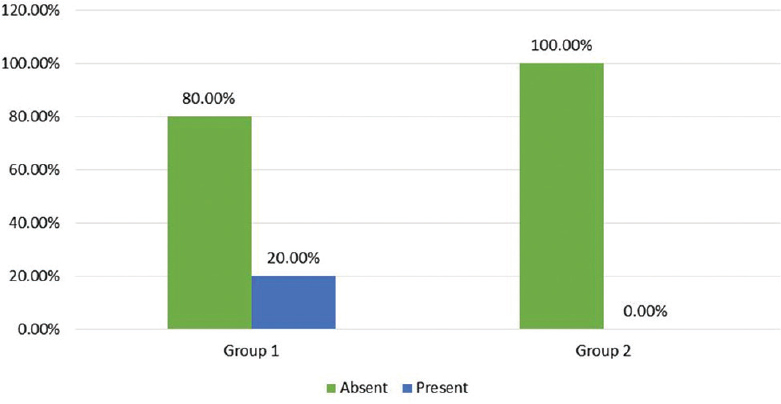 However, there was an increased mouth opening noted in Group II patients when compared to Group I patients during follow-up periods which was found to be comparable and statistically significant as shown in [Figure 2]. With regard to the pain score, in the immediate postoperative phase pain was higher in both the groups with a mean value of 6.70 and 7.00 while in the late postoperative phase, pain gradually came down a mean value of 0.10 and 0.20, respectively, as shown in [Figure 3]. 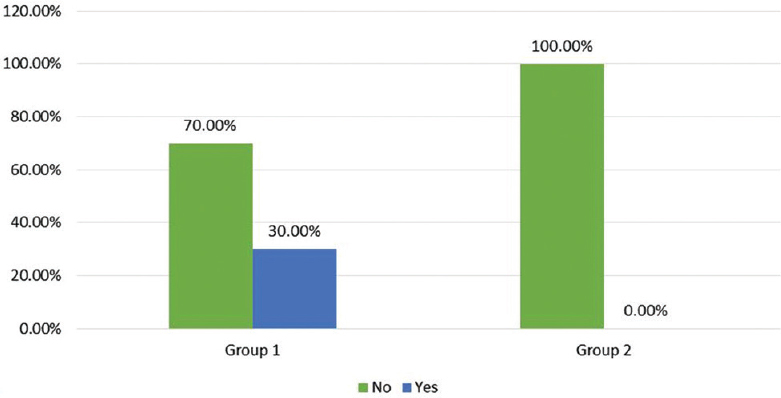 Patients in group II encountered a mildly higher pain scale due to the wide surgical exposure required for adaptation and fixation of the plates in addition to the extra working time required for the surgical procedure in these patients. It was observed that in general there was minimal or no difference in the pain scales when patients in both the groups are compared. With regards to hardware failure, 2 patients (10%) in Group I reported with hardware failure. Two patients reported with loosening of the screws due to infection at the fracture site. Both the hardware's are removed under local anesthesia following sufficient period of bone consolidation using IMF. There was no hardware failure noticed in Group II as shown in [Figure 4]. Potter and Ellis conducted a study to evaluate the results in patients treated for fractures of the mandibular angle with a single, thin, malleable miniplate placed on the superior border. He reported 10.8% of plate fracture with 1.3 mm malleable noncompression miniplates which in turn results in interfragmentary mobility and nonunion. Farmand in his study with 140 patients treated with 3D titanium miniplate reported one case of plate fracture. There was no evidence of nonunion, malunion, plate fracture, and plate loosening in the study in either of the Groups. Mobility of the fracture segments was examined postoperatively in patients of both the groups by simple digital palpation on either side of the fracture line. It was observed that two patients of Group I out of 20 patients had slight mobility of the fractures segments and later decreased over a period of 8 weeks, and by 3rd month and 6th month postoperatively, none of the patients showed mobility. Both the patients in whom there was segmental mobility was put on MMF for additional stability for a period of 3 weeks. None of the patients in Group II had mobility of fractured segments as shown in [Figure 5]. Kennath wan reported that the matrix miniplate provides sufficient stability for the fracture healing. When compared with a single plate, stability is clearly improved, resulting in reduced risk of the plate failure, fracture motion, and infection. Recently, Alper Alkan carried out an in vitro study to evaluate the biomechanical behavior of four different types of rigid fixation with semirigid fixation system that are currently used for angle fracture. This study demonstrated that 3D plates had greater resistance to compression loads than the miniplates using by Champy's technique. With respect to occlusion, six patients in Group I had a mild occlusal discrepancy postoperatively, whereas in Group II, all 20 patients had normal satisfactory occlusion without any occlusal discrepancy as shown in [Figure 6]. Occlusal discrepancy in patients in Group I was treated successfully by placing guiding elastics for a period of 4 weeks. Deranged occlusion is encountered in the patients in whom in addition to having a mandibular angle fracture there is an associated fracture of other part of the mandible such as condyle or the parasymphyis. The results of this study suggest that the fixation of mandibular angle fracture with 3D plate provides better stability with less morbidity and less infection rates. On comparing the parameters of both the groups, patients treated with 3D plating have more feasible of postoperative pain, swelling, and reduced mouth opening due to increased masseter muscle stripping till the lower border for adaption of plate. However, a better stability of the fracture segments was achieved in these patients whereas in superior border plating as the plate was place on external oblique ridge less surgical exposure was needed which in turn causes better postoperative comfortability to the patient. However, there was a mild inter-fragmentary movement leading to mild occlusal discrepancy requiring additional attention in the postoperative phase. The geometry of 3D plate assures a 3D stability of the fracture site and offers good resistance against torque forces acting on the fractured site, thereby reducing the chances of occlusal discrepancy and avoiding the need for MMF for early restoration of angle function. The only probable limitation of 3D plates may be excessive implant material where an extraoral approach is needed for adaptation and fixation. Hence, in these situations, miniplate has advantage over 3D plates. The results of the present study were put to comparison with previous studies on mandibular angle fracture and were found to be in accordance with them. We stand by our hypothesis that the 3D plate was found to be standard in profile, strong yet malleable, facilitating reduction, and stabilization at both the superior and inferior borders giving 3D stability at the fracture site and early return to normal function. They seem to be an easy to use alternative to conventional miniplates for providing satisfactory osteosynthesis. However, a larger sample size may be required to substantiate our results. Singh S, Fry RR, Joshi A, Sharma G, Singh S. Fractures of angle of mandible-A retrospective study. J Oral Biol Craniofac Res 2012;2:154-8. Schierle HP, Schmelzeisen R, Rahn B, Pytlik C. One- or two-plate fixation of mandibular angle fractures? J Craniomaxillofac Surg 1997;25:162-8. Haug RH, Fattahi TT, Goltz M. A biomechanical evaluation of mandibular angle fracture plating techniques. J Oral Maxillofac Surg 2001;59:1199-210. Miloro M, Ghali GE, Larsen PE, Waite PD. Principles of Oral and Maxillofacial Surgery. 2nd ed. Hamilton, London: BC Decker Inc; 2004. p. 401. Farmand M, Dupoirieux L. The value of 3-dimensional plates in maxillofacial surgery. Rev Stomatol Chir Maxillofac 1992;93:353-7. Revanth Kumar S, Sinha R, Uppada UK, Ramakrishna Reddy BV, Paul D. Mandibular third molar position influencing the condylar and angular fracture patterns. J Maxillofac Oral Surg 2015;14:956-61. Michelet FX, Deymes J, Dessus B. Osteosynthesis with miniaturized screwed plates in maxillo-facial surgery. J Maxillofac Surg 1973;1:79-84. Ellis E 3rd, Walker LR. Treatment of mandibular angle fractures using one noncompression miniplate. J Oral Maxillofac Surg 1996;54:864-71. Kroon FH, Mathisson M, Cordey JR, Rahn BA. The use of miniplates in mandibular fractures. An in vitro study. J Craniomaxillofac Surg 1991;19:199-204. Alkan A, Celebi N, Ozden B, Baş B, Inal S. Biomechanical comparison of different plating techniques in repair of mandibular angle fractures. Oral Surg Oral Med Oral Pathol Oral Radiol Endod 2007;104:752-6. Potter J, Ellis E 3rd. Treatment of mandibular angle fractures with a malleable noncompression miniplate. J Oral Maxillofac Surg 1999;57:288-92. Wan K, Williamson RA, Gebauer D, Hird K. Open reduction and internal fixation of mandibular angle fractures: Does the transbuccal technique produce fewer complications after treatment than the transoral technique? J Oral Maxillofac Surg 2012;70:2620-8.